So the sucky thing about The Penthome is that all the side windows face the building next to mine. Tonight, I was leaving a voicemail while walking through my bedroom and noticed a flashing light. It looked like someone in the building across from me was holding a light up to their window and moving their blinds around for like, Morse code signals. I was fascinated and peeked around my blinds. I was just in time to see a guy open the blinds all the way and then point all his lamps out the window. I'm pretty sure he was aiming all the light into my apartment. I was creeped out. So I went to get my camera. I forgot that my camera has this little green light that flashes when I'm taking a picture to help it focus better. Luckily, I didn't see anyone in the window any longer. I zoomed in for another picture and just like in a scary movie, all of the sudden, the guy was back! I threw myself behind the blinds and down to the floor. 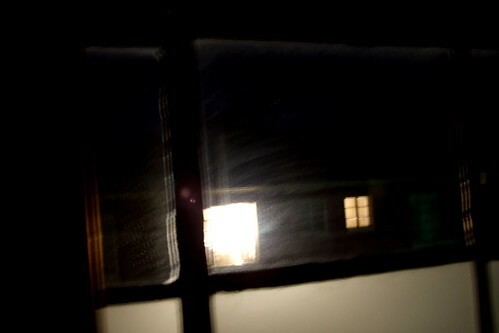 An instant later, all the light that had been flooding my room was dimmed. Dude had quickly closed his blinds. I don't know what's going on over there. But if something happens to me, you might want to investigate that guy's freezer.